While cuddling in bed with my 4yr daughter one morning, she asked if she could play on the I-pad. I’ll be honest, there was a big part of me that dreaded to already hear this request so early. Instead of reacting with a snappy “No” (which I really wanted to do), I chose to stop my negativity and respond with, “We have to do are Good Day Principles first.” She then started to count off pointing her index finger in the air, “1- drink water, 2- eat healthy food, 3-exercise, 4- do math, 5- ice skate, 6- write messages for our neighbors and give them to them.” I am happy to share that she enthusiastically did everything on her list except the lake was not safe for ice skating so she played in snow instead, then she got to play on the I-pad. Thank you for all you hard work and kindness. Your life is a constant stream of miracles. We are glad you are our neighbor. My daughter sealed the envelops and added stickers. I then wrote on the outside “It’s a beautiful day in the neighborhood;-)”My daughter and I then walked in zero degree temperature to hand deliver. My daughter pointed out that this counts as exercise and outside time, too. It really is amazing when you choose to make a positive step and let go of attachment to how things should be, how the positive energy just flows. 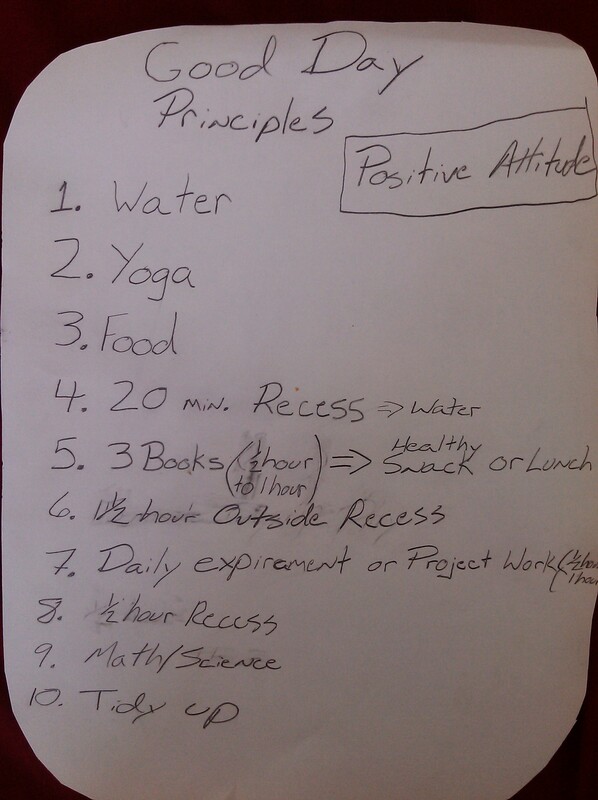 I also want thank my partner who takes my advice and positively engaged the kids to create our “Good Day Principles”. Kids are more motivated to participate in activities and internalize the importance if they are included into the process from the beginning. Yes this does take more time and it may not look how you wanted to, yet, in the long run, it will evoke positive feelings and change in the family. We also home educate so our list reflects this rhythm.